Any of these clauses can be altered by the Company as and when it wants to do so. These clauses can be altered by passing a special resolution of the shareholders of the Company except in case of the capital clause which can be altered by passing an ordinary resolution by the shareholders of the Company. 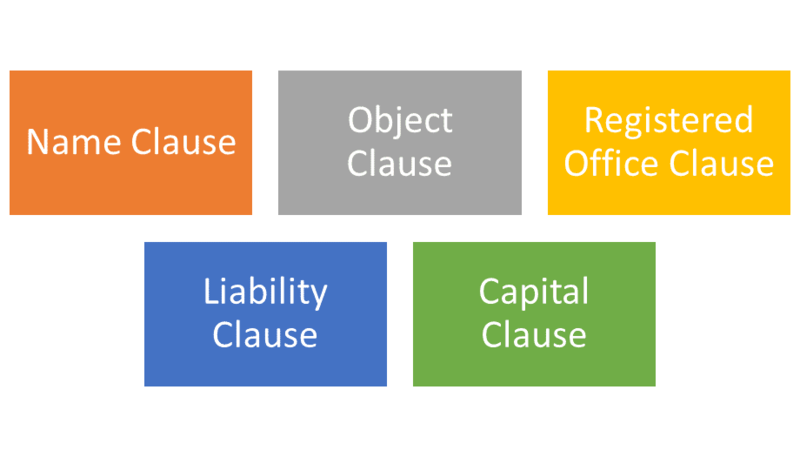 Ques: What is the Object Clause of the Memorandum of the Company? Ans: Object clause is the clause in the MOA of the Company which defines the main business activity of the company. It defines the main objects that the company is going to pursue after incorporation. 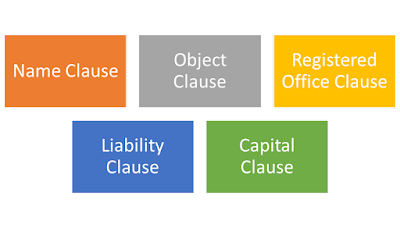 The object clause also enlists the objects that are necessary/incidental for furtherance of the main objects i.e the objects which help in conduct of the Main Objects of the Company or are necessary for the conduct of the main objects. 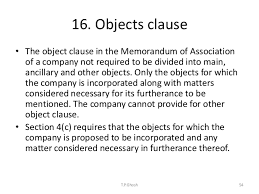 Note that earlier under the Companies Act’ 1956 there used to be an Other Object Clause also which defined all other objects that the company could undertake other than the Main and Ancillary objects. This other object clause has now been done away with under the Companies Act’2013. Ques: What is the procedure for change in the object clause of the MOA? Step 1: First call a board meeting for approval of change in object clause. The agenda of the board meeting will be to approve the change in object clause and to call an EGM to get the shareholder’s approval for change in object clause. The board meeting should be called by giving at least 7 days’ notice. The board will determine the changes in the object clause and will set the agenda for EGM. The board will approve notice for calling EGM by fixing date, time and venue of EGM. Step 2: The second step after the Board Resolution is to issue notice of Extraordinary Meeting to all Members, Directors and the Auditors of the company in accordance with the provisions of Section 101 of the Companies Act, 2013. The Notice contains the date, time and venue of the EGM. The notice will be accompanied by an explanatory statement detailing the reasons for change in object clause. Interest of the director in the resolution should be disclosed in the explanatory statement. The Notice shall be issued at least 21 clear days before the EGM. Step 3: The third step is to hold an Extraordinary General Meeting at the time, place and venue as given in the notice and to pass the necessary Special Resolution under section 13(1) of the Companies Act, 2013, for change in object clause of Memorandum. Step 4: Once the necessary special resolution is passed at the EGM, the company needs to file the special resolution with the Registrar within 30 days of passing the resolution. Form MGT-14 is required to be filed for filing the resolution with the Registrar. Form MGT-14 contains details about the special resolution passed. As per section 13(10), no alteration made under this section shall have any effect until it has been registered in accordance with the provisions of this section. As per section 13 (9) The Registrar shall register any alteration of the Memorandum with respect to the objects of the company and certify the registration within a period of thirty days from the date of filing of the Special Resolution in accordance with clause (a) of sub-section (6) of this section. Therefore once, form MGT-14 is filed, the Registrar will examine the form and register the change in object clause by issuing a fresh certificate of incorporation. Here another thing to be kept in mind while altering the Object clause of Memorandum is that the Registrar may ask for adoption of new set of memorandum and articles in line with the new Companies Act’2013. Therefore, the provisions under the old memorandum/articles may be repugnant i.e. contradictory/inconsistent with the provisions of the Companies Act’2013 and hence may be termed as void therefore it is advisable to adopt new set of memorandum and articles as per Companies Act’2013. 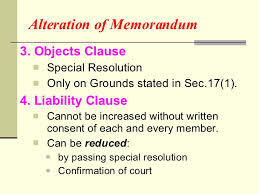 Major reason for that is the change in format of Memorandum and articles under the previous act and the new act’2013. 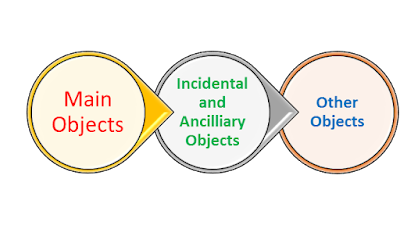 THE OBJECTS TO BE PURSUED BY THE COMPANY ON ITS INCORPORATION i.e Main Objects. MATTERS WHICH ARE NECESSARY FOR FURTHERANCE OF THE MAIN OBJECTS. 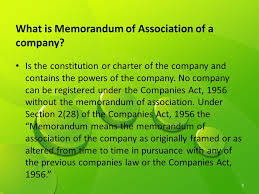 “Pursuant to the provisions of Section 4, 13 and all other applicable provisions, if any, of the Companies Act, 2013, (including any amendment thereto or re-enactment thereof), and subject to necessary approval(s) if any, from the competent authorities, the Other Objects Clause of the Memorandum of Association of the Company be removed by completely deleting the clause III (C)”. Pursuant to the provisions of Section 14 and other applicable provisions, if any, of the Companies Act, 2013, (including any amendment thereto or re-enactment thereof), the Articles of Association of the Company should be altered thereby replacing all the existing regulations with the new regulations.